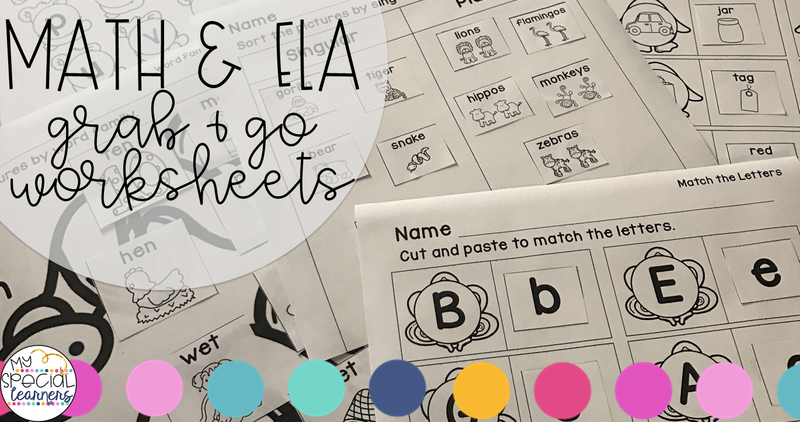 You guys know I'm ALL about file folder activities and other adapted activities, but sometimes I just need something quick & easy to grab and work on with my little friends. Something that doesn't use a whole color cartridge and that doesn't take a few hours of cutting, gluing, and laminating to get prepared. This is exactly why I decided to create some monthly themed math & language arts worksheets that I can use with all of my students! In these packs, I've tried to reach a range of elementary level skills so that most if not ALL of my learners can use them. Anywhere from shapes to graphing and letter matching to word families. Many of these activities are cut and paste to make it easier to use with our non-writers as well! I am SO excited to use these this year to work on IEP goals, in small groups, and to even send home as homework! I used these math worksheets last year with a few of my students and they were AWESOME. I printed them at the beginning of each month, threw them in the student's work bin, and my aides & I were able to grab them and use them as we needed! So quick and easy, and my students loved having the physical work to take home and show their parents! You can find these sets in my TpT shop individually by month or as a bundle! Want to try them out for free? !